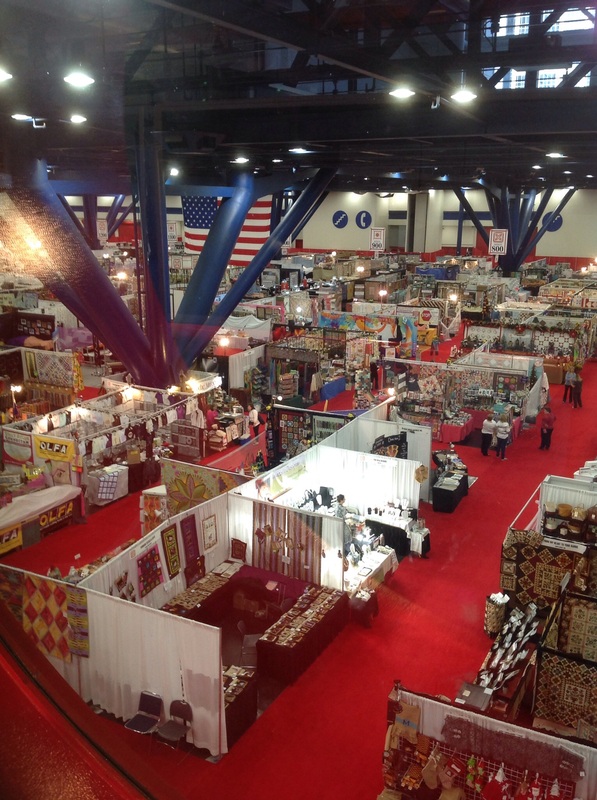 I had the opportunity recently to attend both Quilt Market and Quilt Festival in Houston, Texas. This is an annual event sponsored by Quilts, Inc, also in Houston, to give focus to Quilting, Fiber and Textile manufacturers, businesses, educational and related subjects. I especially wanted to attend the Market portion as it was their 35th year and I was there 35 years ago for the first. . What started in a small conference space in the Houston hotel has grown into filling an entire convention center in downtown Houston has now grown into a $3.76 billion dollar industry. This is according to a study released at the event. The study also reports that one out of every 20 Americans quilt. That first event hardly filled one large meeting room in a Houston hotel – a far cry from the hundreds of vendors at the 35th show. I was able to reminisce with friends and acquaintances from far back as well as new contacts. More long-arm quilting machines are entering the market. Fabric designs keep changing. At the Spring Market earlier this year, we saw an abundance of fabric designs in what was called “the modern ascetic”. The designs were more graphic and larger floral in soft almost pastel colors. Samples shown in the booths reflected the mood given off by these colors and designs. It was interesting at the Fall Market that we saw the same designs but were merged into our more traditional quilt designs/patterns. Handwork was very visible. There was a lot of embroidery much in the style of Red Work from many years ago. (Remember Penny Squares). Well you might not actually remember when Penny Squares were available, but am sure you have seen the designs in vintage quilts. Many vendors showed patterns for these designs. Wool was everywhere and not always in the more primitive design quilts and accessories. A surprise to me was the number of fabric companies from outside the USA. Australia was much in evidence with more from Japan and even Brazil. Very exciting designs were shown by these vendors. Pre-cuts were in every fabric manufacturer’s booth. Pre-cuts are definitely a major part of their distribution. This trend is reflected in books giving suggestions for the best and most economical use of these packages. The exhibit of quilts was, as usual, mind boggling. Since the 35th anniversary color is ruby, the special exhibit of red/white quilts was most appropriate to the event. Renewing friendships and meeting new quilters, eating good food (a favorite is the Fried Avocado from the Adobe Cafe) all made for a memorable time. What do the next few years have in store for us? Who knows?